Summer may be winding down, but summer squash—zucchini, pattypan, crookneck, yellow squash and more— is still piled high everywhere from farmers' markets to your local grocery story (and maybe even in your backyard). Running out of ideas for how to use it? Here are five unusual, ingenious ways to relish this creamy, delicately flavored, versatile vegetable while it's still at its peak. 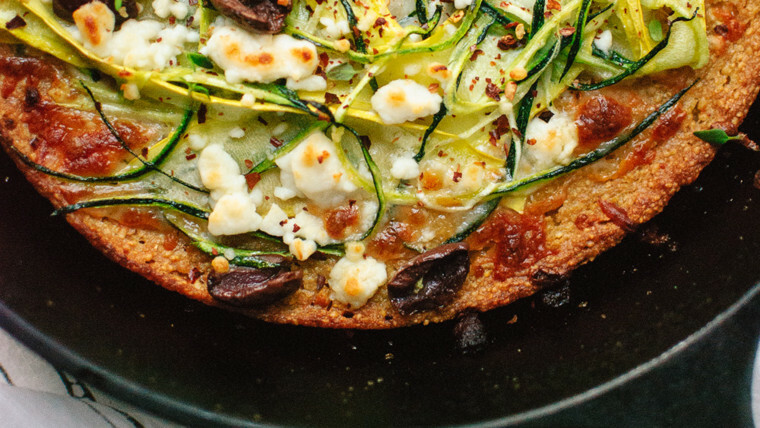 Chances are this super-crunchy, South-of-France-inspired pizza is unlike any you've had before: It's made with chickpea flour and topped with yellow squash, feta cheese, briny Kalamata olives and fresh thyme. Swap the same-old potato hash browns for these low calorie, low-carb, gluten-free squash fritters—and you'll want to serve these at every weekend brunch from now on. These four-ingredient squash chips take only minutes to prepare, and they deliver a fresh, healthy snack alternative to the packaged (and processed) kind. Crazy about biscuits? Try these fluffy, squash-spiked beauties, loaded with tangy cheddar and perfect for breakfast or dinner. Squash for dessert? You'll be sold the moment you try this recipe, which combines summer squash, lemon juice, lemon zest and sugar to create a moist, citrusy-sweet loaf that will vanish in seconds.